(b. )They are reasoning unsoundly and, therefore, are unable to see that some spiritual belief is true. Now if (a.) is the case, then the unbeliever’s epistemology is faulty, as it is driven by his desire to suppress the truth. And if (b.) is the case, then the unbeliever’s reasoning is inherently faulty, as it is unable to lead him from the evaluation of non-spiritual evidences in defense of spiritual matters to an affirmation of the Christian faith. (a.) and (b.) are ways in which fallen men suppress the truth in unrighteousness, the former being an active suppression of the truth, and the latter being a passive suppression of the truth. What we mean here by active is that the unbeliever is constructing an epistemology that a priori repudiates, or identifies as illegitimate or false, any claims concerning the doctrines of Christianity. As for the passive suppression of the truth, what we mean here is that by simply thinking as a fallen creature man’s reasoning process, by virtue of its inability to draw the correct conclusions from proposed evidences, suppresses the truth (it is “in unrighteousness” as it stems from the heart/mind of fallen man, it is corrupt fruit from a corrupt tree). Thus, whether he is active or passive, fallen man’s reasoning has been profoundly affected by the fall. When we look at Scripture’s representation of fallen man’s thinking, we see the above considerations further confirmed. Let us consider some Scriptures that demonstrate our main points. a. Literal Signification – Adam understands the plain meaning of God’s blessing, as well as his announcement of man’s responsibilities in his earthly and spiritual labors (cf. Gen 2:16-17). Adam understands the bodily processes of eating, procreating, ordering/exercising dominion, etc. b. Metaphor – fruitful and face are metaphorical expressions denoting, respectively, the abundant production of offspring and the visible top layer of the ground. 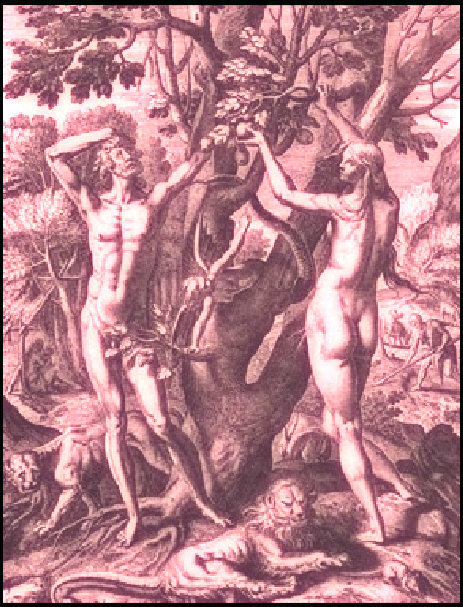 It is clear that Adam can differentiate between the metaphorical and literal use of the word fruit-ful seeing as he understands that God has given him fruit to eat, as well as prohibited him from eating another kind of fruit. c. Proper Names – Adam understands the function of proper names, as designations of distinct identities (cf. Gen 2:18-20 & 23; Gen 3:16 & 3:20). d. Interrogatives – Adam understands the function of questions, broadly speaking, to elicit information from the one questioned (cf. Gen 3:9 & 11). e. Imperatives – Adam understands that imperatives are to be obeyed (cf. Gen 1:28 & 2:16-17). d. Indicatives – Adam understands God’s actions, as articulated by God, as actions (cf. Gen 1:29-30; 3:17-19). e. Metonymy – Adam understands that he is not literally dust, but made from the dust of the earth (cf. Gen 3:19). Given that Adam was created with this knowledge already, it follows that God gave Adam the knowledge he possessed. The knowledge was not gained through Adam’s sensory experiences, but given by God freely to him. What is more, Adam’s profession as tiller of the ground (cf. Gen 2:15) does not imply that he neutrally gained knowledge about the grounds by means of experience, since God declares the he is the one who has “rightly instructed” the man who sows and plows the earth (cf. Isa 28:23-29). Thus, even Adam’s knowledge of how to plant seeds and care for God’s vegetation is that which God has revealed to him. Adam’s knowledge was given to him by God, as is the knowledge that all of Adam’s posterity possess from birth. And that knowledge, coming from God himself, is good. However, with the fall of man came the corruption of man’s mind. We see this as early as Gen 4:8, where it is safe to assume that Cain lied to Abel in order to kill him. This is confirmed, it seems, by Cain’s willingness to lie to God in Gen 4:9. Later in the chapter, Lamech attempts to use his knowledge of God’s dealings with Cain (cf. 4:8-16) to justify his own wicked behavior (cf. Gen 4:23-24). Thus, we see a downward progression away from the righteous use of the mind in non-spiritual and spiritual matters to the perverse use of the mind in non-spiritual and spiritual matters. God identifies the corruption of man’s mind as encompassing all of man’s intellectual life in Gen 6:5 & 8:21. Man’s thinking is, according to God himself, corrupted by sin, even down to the very root. There can be, therefore, no epistemological neutrality. 2. The Suppression of the Truth is Active – In Matthew 16:1-4, the Lord Jesus rebukes the Pharisees for their acceptance of weak empirical evidence meant to prove that the weather would be good or bad, with their rejection of the very strong, indeed infallible, evidence of his person and work made manifest in his miracles. Although they saw Christ fulfill the Scriptures in their hearing (cf. Luke 4:16-30, they grew wrathful upon his having pointed it out to them. They could not accept the truth, despite the fact that there was convincing evidence of his person and work (cf. John 10:31-38). This must be pointed out, lest the reader forget – these were not fallible attempts at rationally defending the Christian faith. Rather, they were infallible proofs from Almighty God Incarnate. Yet fallen man cannot see or hear or believe the truth. Evidence is not the problem, but sin. 3. The Suppression of the Truth is Passive – This is implied by the Lord’s words in Gen 6:5 & 8:21, as well as Jer 17:9. The entirety of fallen man’s mind is mired in wickedness, constantly seeking not the truth but sinful self-satisfaction. As we noted earlier on, the mind that is set on the flesh cannot please God. Thus, even when receiving knowledge fallen man’s mind is doing so in a way that is corrupt. The noetic affects of sin are demonstrable not only in fallen man’s defensive construction of anti-Christian epistemologies, but also from fallen passive reception of truth as given by God in general revelation. In this brief article, we have demonstrated from Scripture that the use of a presuppositionalist approach to doing apologetics is necessary. We have demonstrated that the Scriptures teach that truth is given to man by God and is not, therefore, neutral. Rather, all of creation testifies to who God is, but man, since the fall, perverts the truth given to him by God. We have shown, then, that fallen man’s reasoning has been corrupted to the core by the fall. God identifies every thought of the hearts of fallen men as being desperately wicked. We have, lastly, demonstrate that man passively receives knowledge through a corrupt mind, and actively constructs epistemologies that serve his corrupt mind. Thus, we are required to argue presuppositionally when engaging with unbelievers over the truth of the Christian faith. The Christian faith is the foundation from which we argue, not the goal toward which our argumentation is geared. Apologetics is not a figuring out of the faith. Apologetics is the defense of the faith. 1 For a personal account of how even the most abstract reasoning stems from a corrupt heart, see Diaz, Hiram R. Non-Neutrality: A Personal Testimony (Lewiston: Scripturalist Publications, 2017), 60pp.